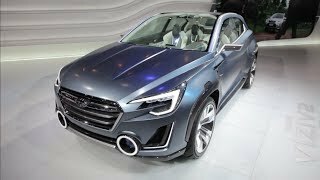 Subaru revealed the Viziv Concept at the 2013 Geneva Motor Show, which is a future-generation crossover concept that represents the new design direction and technologies that will take the Subaru brand into the future. 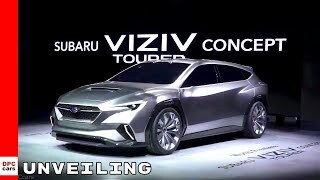 "VIZIV" is a coined word inspired by the phrase "Vision for Innovation" to express Subaru's future vision of innovation and the future direction of the brand. 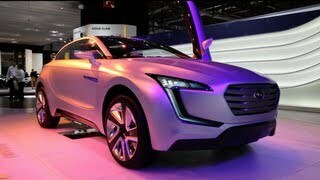 The "Mistral Silver Metallic" exterior color highlights the dynamic, stylish exterior design of the Viziv Concept. The basic design features simple and clean surfaces and lines. The aim was to create the ideal balance between a solid-looking body and a condensed cabin. Like the exterior, the interior invokes the promise of dynamic road performance. The cockpit features an instrument panel layout designed primarily for ease of driver operation and vehicle control. The instrument panel displays the operation status of Subaru's own driving assist "EyeSight" system. 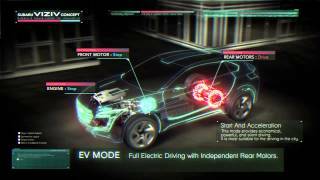 The powertrain is a plug-in hybrid system that combines a 2.0-litre Subaru Boxer diesel engine and high-torque-compatible Lineartronic (CVT) with a front motor that provides both vehicle drive and power generation, and two independent rear motors for vehicle drive only. Engine and motor power are subjected to fine-tuned control according to the travel conditions captured and detected by the EyeSight's stereo camera, creating an intelligent driving feature designed for safety and environmental friendliness.